EBooks have now gone mainstream – the sales figures prove it. 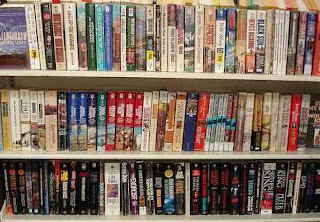 And one of the implications of the rise of digital books is that previously ignored genre fiction can be made more readily available than ever before. Take the western for instance, which has been conspicuous by its absence from most book stores for a great many years, but thanks to the popularity of eBooks has made a comeback. 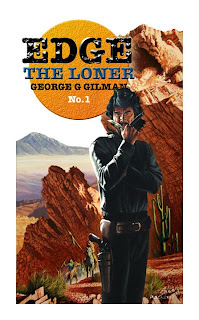 Visit any eBook store and the chances are better than good that they will have an eBook section devoted entirely to westerns – the coolest genre of them all. Which leads us to our Magnificent eSeven eBooks, each of which will provide top quality western writing and we hope you enter into the spirit of things and buy one of these eBooks, or indeed any other western, this Wild West eMonday. Go on – spend a few pennies and show the authors who have worked hard to provide this Wild West eMonday weekend of western posts, that all our efforts are worth it. It’s a win/win situation for the reader, since we guarantee that each of the very different westerns selected in our Magnificent eSeven will provide top quality entertainment, but beware they are dangerous and will likely lead to severe genre addiction. So come on folks and enter into the spirit of Wild West eMonday and buy a western eBook this Wild West eMonday. You don't have to select one of our Magnificent eSeven but each title is guaranteed to entertain. Later on today, it's Monday where I live, Wild West eMonday, we will give you the rest of the images in the competition to win a signed copy of The Ballad of Delta Rose and from there on in it's business as usual on The Archive. 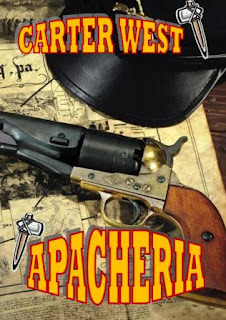 Thanks to everyone who helped make this weekend of western posts so varied and interesting and thanks to all those who buy a western eBook today. How about letting us know what you bought in the comments section of this post. PRETTY PLEASE! Saddle up - It's Wild West eMonday!!!! Oh and what did that curious image I've been randomly posting mean? Why it's Wild Bill Williams but more of that later...much later. This Wild West eMonday has been brought to you by,"I'MF**KINGSHATTEREDNOWPRODUCTIONS." When I first became friendly with Tony Masero I knew him chiefly as the cover artist of many of the books in one of my all time favourite western series, Edge by George G. Gilman. At the time I was involved in bringing the first Edge novel back into print via the digital medium, and using the internet I approached Tony to provide a cover for the new electronic version of the Edge book. 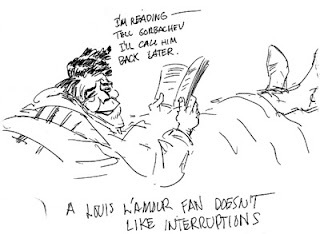 He did and then Tony asked me to look at a book idea he was working on, the artist had picked up a pen. 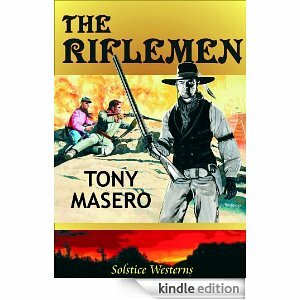 That book eventually became The Rifleman which is available from Solstice Publishing now. 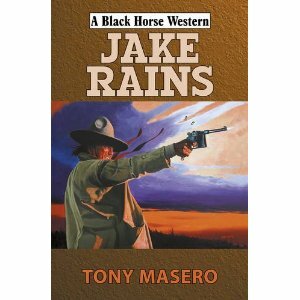 And later this year Tony will see the publication of a second western, Jake Rains - This time the book will come out from my own publisher, Robert Hale and their Black Horse imprint. Incidentally all of the images on this post are Tony's work. I asked Tony about his novels The Rifleman and Jake Rains. ‘Jake Rains’ is my first book to be published in hardback. Hale Books (aka Black Horse Westerns) were kind enough to let one of their cover artists have a try with the pen instead of the paintbrush and miraculously it was accepted and they let me do the cover art for my book as well. 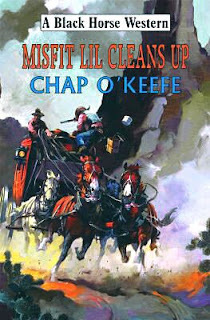 Having painted Western book covers for four decades, it seemed about time to put something between the covers instead of on them. Over the years its meant a lot of visual research whilst doing the Edge and Steele series amongst others and that of course led to an interest in the era and also, like so many of my generation, as a youngster I was raised on a diet of both Western movies and comics. I guess in a way I like to push the limits as it were, so although ‘Jake Rains’ is a story about a cowhand and a crook, there are some differences with the traditional take. Jake is a Mauser pistol touting Rough Rider just back from Teddy Roosevelt’s campaign in Cuba where he swore to his dying friend he’d take care of his widow. Soon he runs foul of the local cattle baron who’s courting the widow. After that, it’s crazed Mountain Men, a racing Winton Phaeton and a preaching killer who are all met on Jake’s way to a bloody shoot out on Main Street. The second book, out now as an e-book by Solstice Publishing but soon to be in hardback is ‘The Riflemen’ is a tale about two ex-Civil War sharpshooters who were master and slave before the war and end up as friends and partners after it. They are commissioned to take out a wealthy renegade who is raising a new Confederate Army south of the Border. 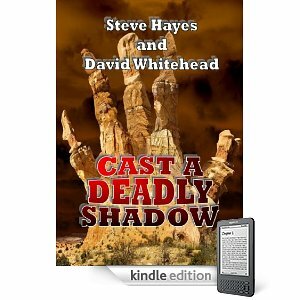 Tracked by a trio of killers they make their way through Indian territory, meeting all kinds of woes along the way until finally tracking down the renegade at his base in an old Aztec ziggurat. It doesn’t end there and before it does the duo’s pair of Sharp’s long rifles came in for plenty of use. So was it difficult after a lifetime spent with the brush to pick up the pen? I’ve always written, well certainly as a young man in the sixties but more in a private way. There was something initially attractive about describing the pictures that came into my mind using the written word alongside the visual interpretation. If you’re born with an imagination I guess it’s a natural progression. The skill in actual production comes later, be it using either a brush or a pen. A big help with technique on ‘The Riflemen’ was my editor at Solstice, Nik Morton who also writes his own Western novels under the name Ross Morton. Nik recently asked me to do the cover art for his latest Black Horse book ‘Old Guns’ and Hale have agreed to the commission. It’s a double honour for me as Nik is an illustrator in his own right, so praise indeed. So then will there be more from Tony Masero the writer? At the moment my third Western novel ‘The Hunted’ has been accepted by Solstice and is going through the production process. Once again I get to do the cover art, which is great for me as it kind of completes the circle. 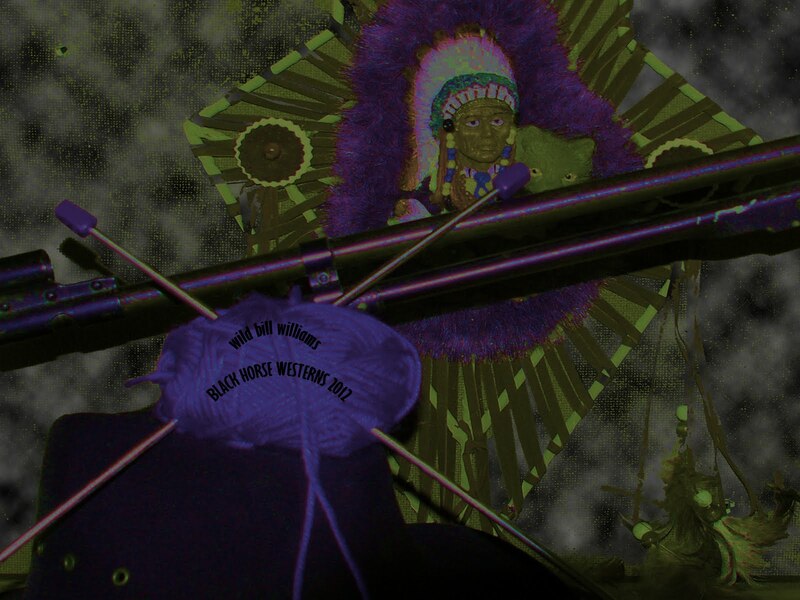 You can view the original artwork on my website at: www.artnillustration.com The story is about a wealthy cattle baron with a past, who receives an invite to visit with one of his old comrades. The sickly comrade leads him on a path that takes in tracking down three other friends from the old days and leads him back to a brutal Civil War atrocity, a vengeful prisoner in Yuma prison and a fortune in Confederate gold. Somewhere along the line though a hidden killer is trailing him and the story isn’t over until the assassin is revealed. The success of the books, ‘Jake Rains’ already reaching a healthy pre-publication listing on Black Horse’s top ten, certainly encourages me to continue writing. Inspiration is not a problem and I’m already bubbling with new ideas. It intrigues me to write stories on the edge of the traditional Western format and a little out of the ordinary …. but, failing that, there’s always another cover to paint! 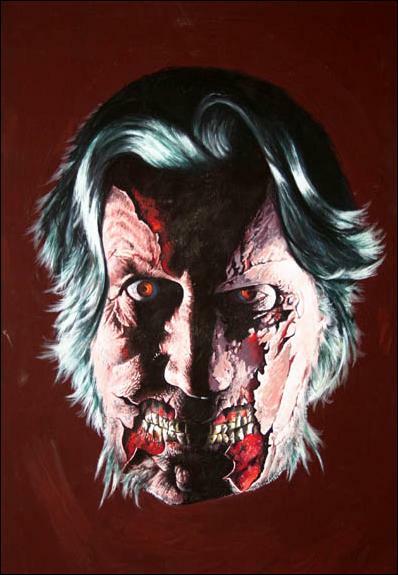 Indeed there is and Tony's next commission is to produce a cover image for my forthcoming novel, The Dead Walked which will see me switching to horror and the pen name Vincent Stark, but it's my bet that very soon the name Tony Masero will be as much associated with his writing as it is with his stunning artwork. 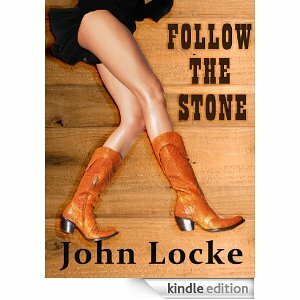 And to show how varied the genre can be we have selected John Locke's Follow the Stone. You could hardly call this comedy western traditional, but that's part of the charm. It's a rollicking adventure that plays with genre conventions and drags the reader from page to page. Well after all this work putting together Wild West eMonday, I'm sure you all won't begrudge me a little self promotion. 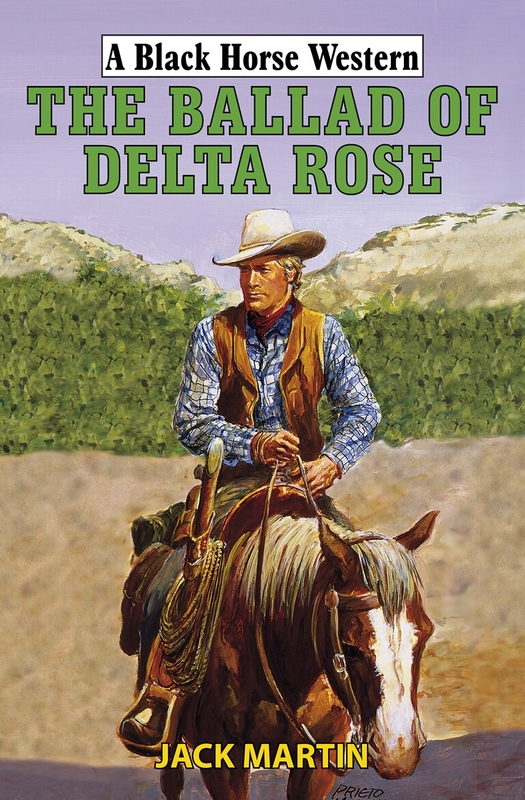 And so here is Steve M's review of my latest novel, The Ballad of Delta Rose. I'm especially pleased with this review as Steve certainly knows his westerns. 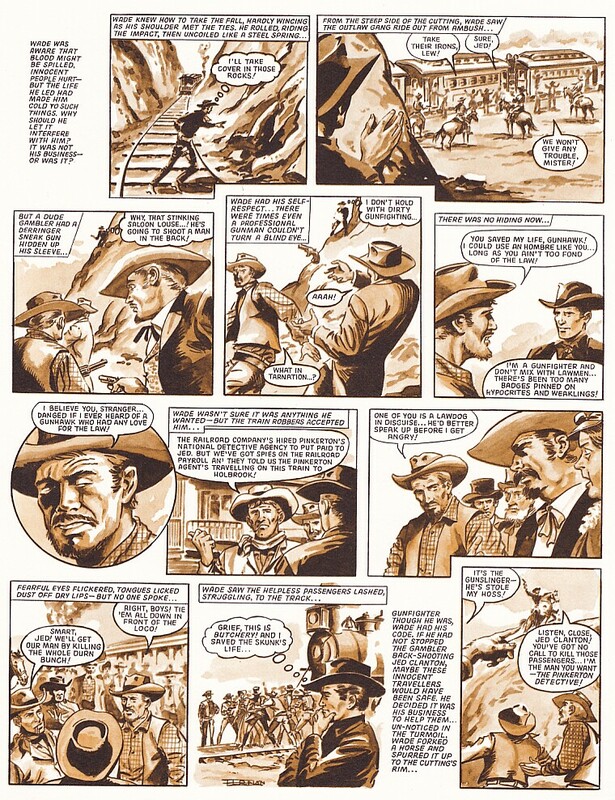 Today's Sunday Comic is wild west themed to keep in the spirit of Wild West e-Monday. Our main strip, The Train Robbers was written by Keith Chapman in 1966 and published late summer 1967 in Boys' World Annual 1968. 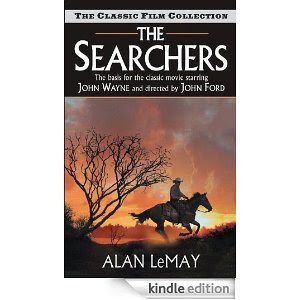 Keith (best known to us today as western novelist Chap O'Keefe) says, "It has nothing to do with the 1973 John Wayne movie written and directed by Burt Kennedy – except that the movie picked up the same title." 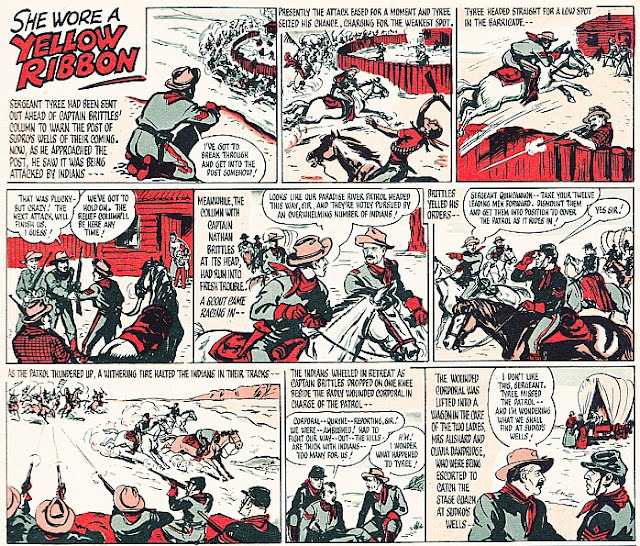 The simple, four-page comic-strip was very much a late entry in a tradition of UK-produced, boys' western comics that had been dominant in the 1950s before they were all but swept away by the growing popularity of World War II comics. British kids and their parents in the late '40s and early '50s probably were not ready to see war as something to read about for fun. 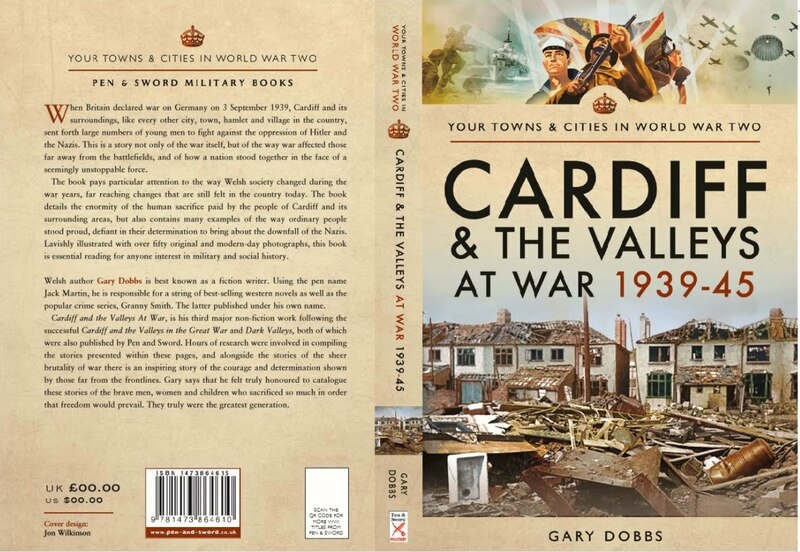 At worst, the revived memories of war could involve the loss of loved ones, homes, and property. At best, war was associated with shortages and rationing, which continued for luxuries like "sweets" (chocolate and candy) years after the war was over. Even story papers, comics and books had been affected by multiple closures and limitations on new periodicals; all print-and-paper production had been shaped by "authorized war economy standards". The Wild West was a safer, mythical world of action and derring-do; a removed and different kind of "bang and he's dead." Among the new, post-war comics were the photogravure Sun and Comet, originally published in 1946 by J. B. Allen in provincial Cheshire but soon taken over by the London-based Amalgamated Press. In their early years, they published serial strips printed in distinctive green and red inks and sometimes based on Hollywood movies. 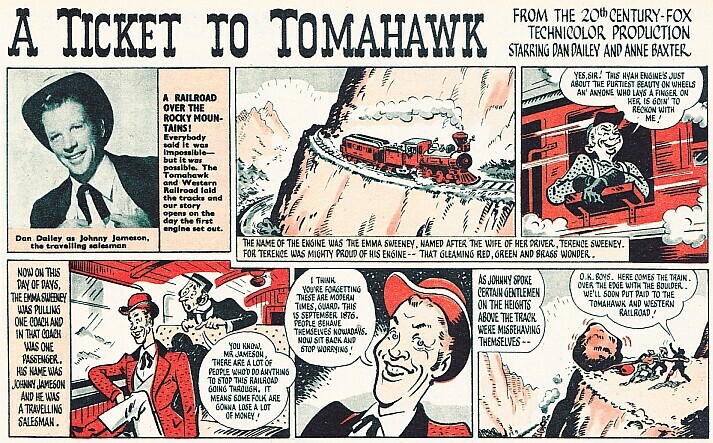 Examples we show here from 1950 were based on the now-classic westerns A Ticket to Tomahawk and She Wore a Yellow Ribbon. 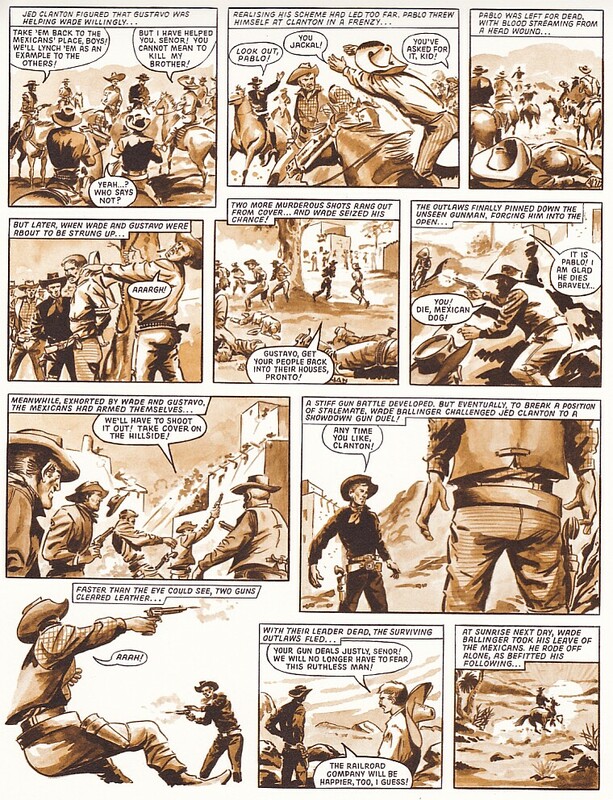 Elsewhere at the AP's Fleetway House in Farringdon Street, other staff turned their attention to a new format: monthly pocket-book comics of 64 pages containing complete stories, often featuring heroes who also starred in serials in the Fleetway weeklies. The digest size was probably chosen instead of US standard measurements for monthly comics because the company's presses had produced for years text-story "libraries" in the more compact, saddle-stitched format. Cowboy Comics was launched in April 1950 and its initial stars were Buck Jones and Kit Carson. 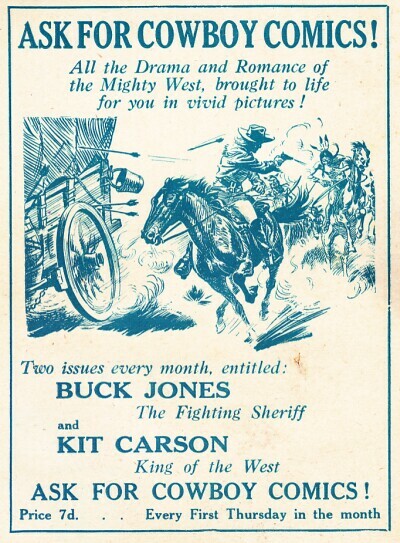 In mid-life, in 1957, the series title was changed to Cowboy Picture Library. By 1962, with many readers lost to War Picture Library and its like, the line was struggling. It folded in September of that year after 468 issues. Meanwhile, midget rival publisher Micron Publications was launching a Western Adventure Library to fill the gap left by CPL. Its storylines didn't feature stock heroes but reflected the general run of adult western fiction. Under the editorship of Keith Chapman, who joined Micron from Fleetway, the scriptwriters for these new 64-page comic books included Vic J. Hanson (later a prolific Black Horse Western author) and Jacques Pendower, a veteran author of all kinds of genre novels, including westerns as Penn Dower and T.C.H. Jacobs. 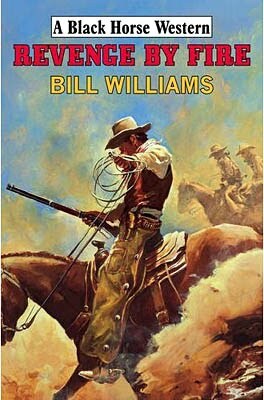 Western Adventure Library was quickly joined by a companion Cowboy Adventure Library, doubling the publisher's westerns to four books a month, thus matching output of its Combat Picture Library war series. 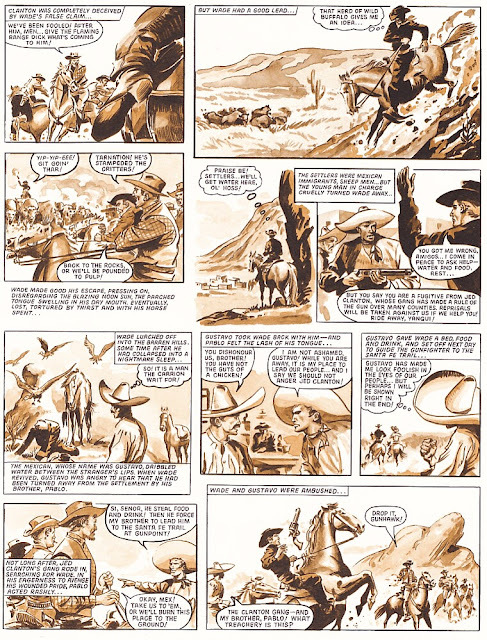 Though the artwork was commissioned from the beginning through Spanish agencies, Micron's financial difficulties eventually led to its sourcing, translating and reprinting Spanish-language western comics produced by Barcelona publisher Editoral Ferma. 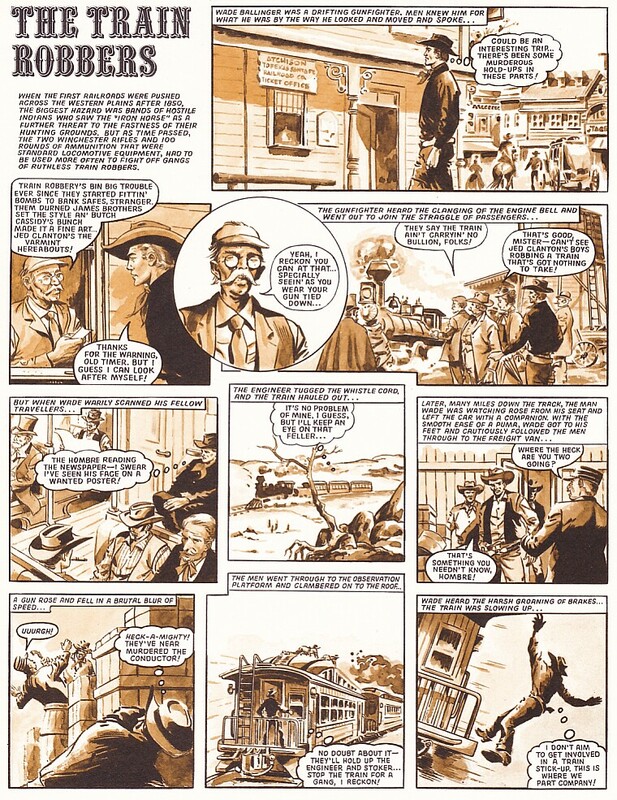 By late 1964, the ownership of Micron had changed, too, to its comics' overall detriment, and Keith Chapman was working for Odhams Books ... which brings our story back neatly to that company's Boys' World and The Train Robbers. And because the Archive is the place where you always get more please enjoy these two pages that are sure to delight western fans, and then scroll down to read The Train Robbers. Don't forget you can click each image for a larger version. "The fact that nothing ever needs to be out of print is, as far as I’m concerned, a big plus to digital publishing. It means that in theory everything ever written can be easily available. I also think that genres such as the western can reach a bigger audience as eBooks. I don’t really think there is a downside other to eBooks themselves since traditional books should be able to co-exist with this new technology. 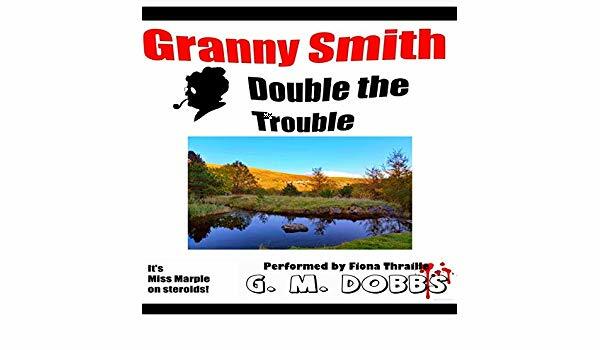 The ease of self publishing means that at the moment there is a lot of swill about and that could be seen as a downside, but quality will out and in time the bad writing will simply vanish. So long live the eBook." We've already posted one other image and there'll be another three - that's five in all. All you have to do is take a long hard look at the image that accompanies this post. 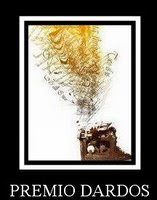 Study it and then look out for the other four severely cropped images over the weekend and then tell us which book these images come from. To make it all nice and easy each image used will have come from a book that will be featured during the weekend. You'll see the complete cover during the weekend and all you have to do is identify which cover the images were cropped from. Wild West eMonday - what about Delta Rose? In all the fuss we neglected to mention that this novel by a certain chap called Jack Martin (that's me, folks!) was published yesterday - it's print only for the moment but I'm mighty proud of this one and hope readers enjoy it. Once again Jack Martin takes his ingredients and turns them into a tasty treat. Incident piles upon incident that gathers speed until justice is seen to be done. I had to include at least one all time classic western amongst The Magnificent eSeven and it had to be this one. Why? Well I read it for the first time ever recently as a Kindle eBook and was stunned. 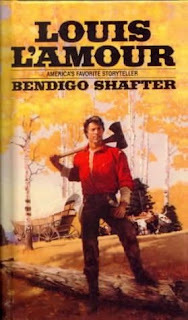 The movie that came from this book is, to my mind, the best western movie ever made and the book is just as good, if anything the book is far more powerful in dealing with the racist aspects of the lead character. Ethan Edwards becomes Amos Edwards in this great American masterpiece, which served as the basis for the classic John Wayne film, two men with very different agendas push their endurance beyond all faith and hope to find a little girl captured by the Comanche. 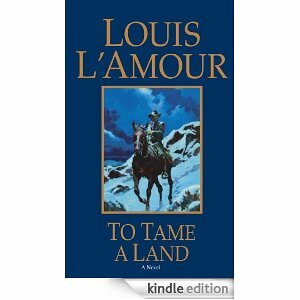 It's a brutal read but it doesn't pull any punches in dealing with attitudes that were common in frontier America. A true work of art. And now that boy has become a man but that boyhood love of storytelling, and specifically westerns is still with him. 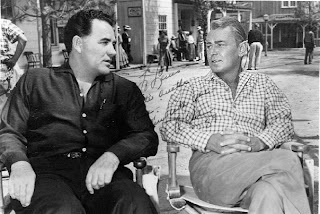 To date he has penned almost fifty westerns under a handful of names as well as venturing from time to time into other genres. And now David is making many of his backlist titles available electronically which should excite any western fan. Just goes to show what we've been saying around here for ages now - if you're a western fan there's never been a better time to get a Kindle, Sony, Nook or other eReader. David has used many names over the course of his career - Ben Bridges, Carter West to name but two of a wild bunch - but what's in a name? Is there any difference between a David Whitehead and a Ben Bridges for instance? "Yes, there are subtle differences between the styles I use for the different pseudonyms. ", David told the Archive. 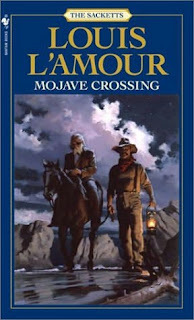 "Ben Bridges, for example, was always a tougher style with action as the main driving force, whereas my westerns as Glenn Lockwood (which have yet to appear in ebook format) were far more character-driven. Overall, however, I would say there are more similarities than differences. I hope always to tell a good, original story the old-fashioned way, with a beginning, a middle and an end." The new electronic editions are sporting stunning new artwork, with a uniform look. The Archive liked the design, told David so and then wondered who the artist was. David smiles, "Many thanks for your kind words regarding the covers," he said. " I like them, too! I buy the illustrations from various agencies and then design the cover text around them. I think it's important to have a recognisable 'house style'. I don't use photographic covers, for example, always illustrations. The text is always bright and eye-catching." 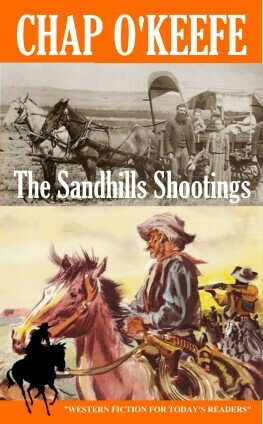 Eye catching indeed and the cover images evoke memories of the golden days of the westerns. 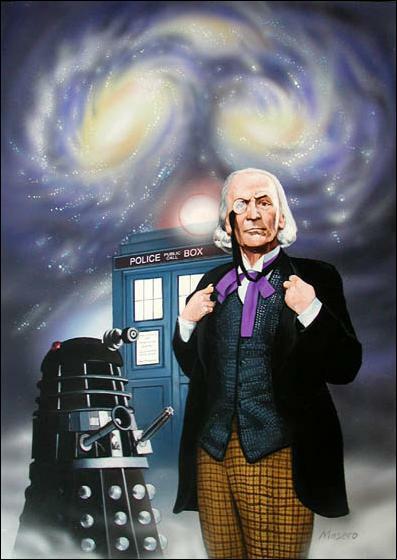 "I suppose I've been influenced by the good old days of Richard Clifton-Dey," David continued. "And Tony Masero and David McAllister. Anything I can do to recreate that feel of the old Piccadilly Cowboy days is all to the good." "I was born wanting to write. And since my Dad took me to see all the western movies that were still being made during my childhood (the 1960s) and we were forever watching westerns on TV, and since he used to make up western stories for me and then read them into a reel-to-reel tape recorder so that I could listen to them while he was working evening shifts as a security man, the western seemed a natural genre for me." 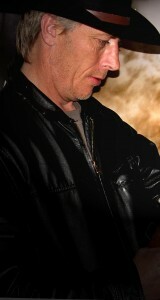 David Whitehead. Bringing these modern western classics back into print via the digital medium must have presented more than a few problems. I have bought several eBooks over recent months in which the formatting is abysmal, with text running across the page as if set by an epileptic on cocaine, and yet the formatting in these editions is spot on. How much of a challenge was this? "It was difficult to format the books for Kindle, David admits. "But only at the outset. It was very much a case of the blind leading the blind. 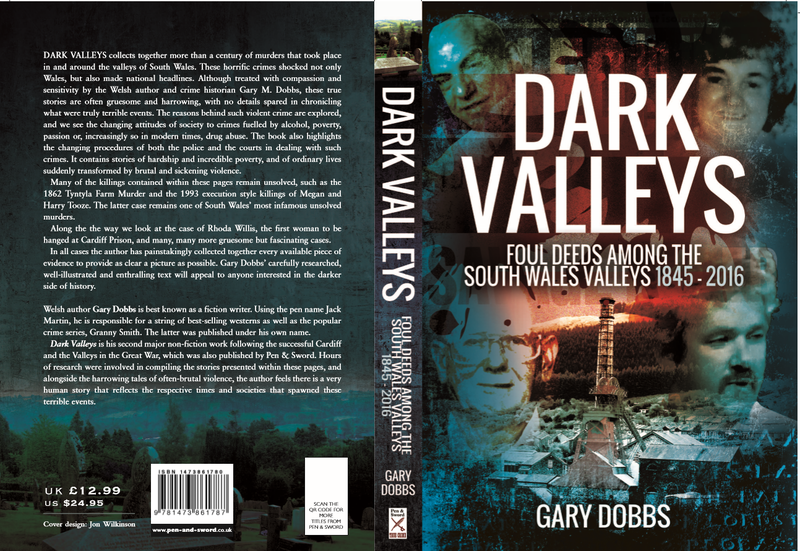 But I had the great good fortune to have a wonderful friend in the shape of Malcolm Elliott-Davey, who writes westerns as Cody Wells and whose first BHW, SIX WAYS OF DYIN', is now awaiting publication. He educated me as to the right way to do this thing, and I will always be grateful to him for that." 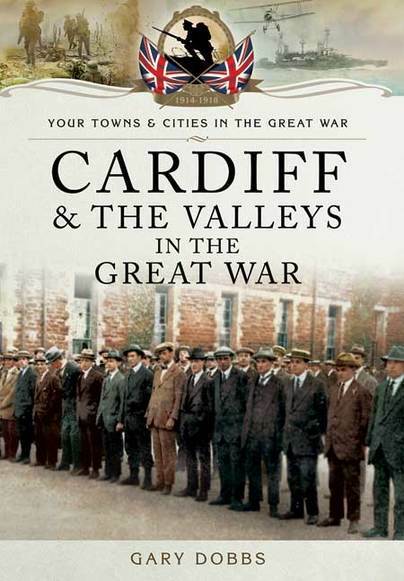 And western fans should also be grateful to Malcolm Davey AKA Cody Wells because the books are now out there. 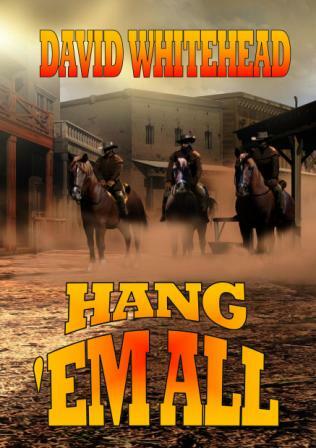 There are some great titles in David's backlist and western fans should give one of these books a try, but prepare to dig deep and buy the rest. David's writing, like that of all great western writers, has an addictive quality. The books he wrote with Steve Hayes for instance are among the best I've read in many years. "I always wanted to bring my old books back into print." David said. 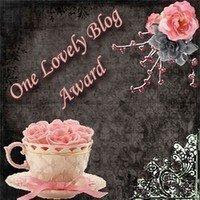 "If there was no such thing as Kindle I would have started issuing them in paperback via a site like www.lulu.com. I would have probably issued them as uniform sets, say with blue spines for the O'Briens, yellow spines for The Wilde Boys, grey spines for the Judge and Durys etc., so that when you had the lot they would look really beautiful set out on your shelf. But that would have been an expensive proposition for the reader, especially when you think that we're talking about seventy books here. Kindle enables the reader to buy the book at a bargain price and receive it instantly as a download. It's more convenient all round." What is also convenient is that using the Amazon store readers can download a sample of each book and then after reading you can decide to buy the book. They're all priced reasonably, cheaper than a new paperback. So come on - readers who want to head West best take a short detour up the Amazon. When the book was originally released it sold out in twelve days! This must be some indication to how popular Chap O’Keefe’s westerns are. 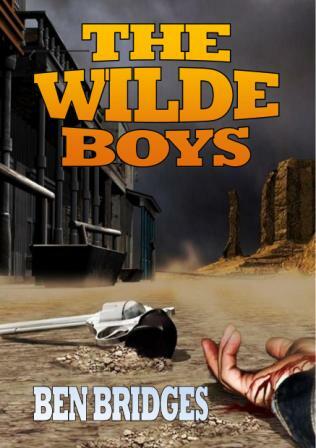 Author Chap O'Keefe is a good friend of mine, but that didn't guarantee his inclusion among the Magnificent eSeven - far from it, each of the seven titles chosen for promotion during the Wild West eMonday are fully deserving of their place on the list. Indeed the problem I had was that there are several O'Keefe books now available as eBooks and being a big Misfit Lil fan I was torn as to which title to include amongst the seven eBooks. 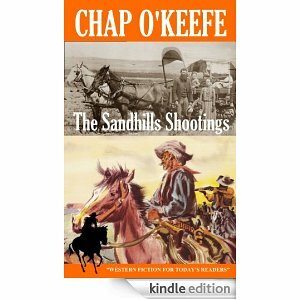 I had originally intended to feature Misfit Lil Cheats the Hangrope, but In the end I opted for The Sandhills Shootings, simply because it is Chap's newest eBook release. It may not be a Misfit Lil title but protagonist Joshua Dillard is no slouch. Ex-Pinkerton detective Joshua Dillard was a gun for hire. He was also a man given to doing only what he had a mind to do. So he refused the presumptuous Omaha financier Fergus O'Callaghan's money, but rode the trouble-busting trail to the Sandhills region of Nebraska anyhow. In that country were his dead wife's brother Tom Holley, a tenderfoot deputy unversed in frontier life's wicked ways, and beautiful Ruth Swain, gutsy widow of a murdered homesteader. Both were up against the odds. Their obvious enemy was salty rancher Stella Tinwald, who cracked the whip for the cattlemen's association -- when she wasn't corraling likely young studs of the two-legged kind. Joshua was set to take on Tom's and Ruth's fights. The odds were stacked against Joshua and a drygulcher's bullet pushed him to death's brink ... but he was a mighty hard man to kill. enough to handle just about any situation, despite his occasional self-doubts, but not a superman by any means. I’m ready to read more about him right now." David Whitehead aka Ben Bridges: "Joshua Dillard once again emerges as a wholly credible and eminently likable protagonist." 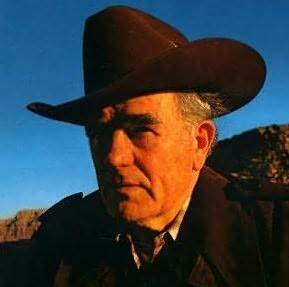 "The thing to remember about this appetite for Westerns and the West is that millions who possess it are entirely uncritical. They’ll take anything in buckskins, literally. The Karl May cult in Germany has not even begun to slow down, although May died in 1912 and was himself never west of Buffalo. 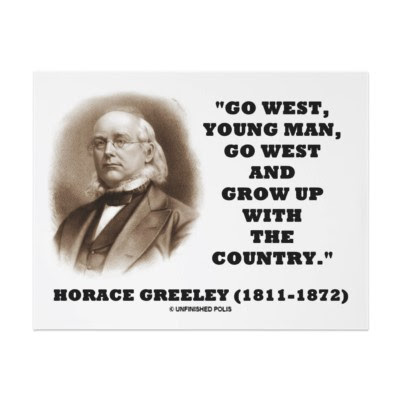 Indeed, as I discovered with Lonesome Dove, it is really impossible to get people to look at the West critically - they just refuse. The director John Ford is said to have decreed that if you have to choose between the truth and the legend, print the legend. From my experience I’d say that there’s really no choice: for most readers and viewers it’s the legend or nothing." This video comes from the third Wild West Monday - a time before the rise of eBooks but the message's the same. So that's what Wild West eMonday is all about - OK the emphasis is on westerns but it's about more than that. 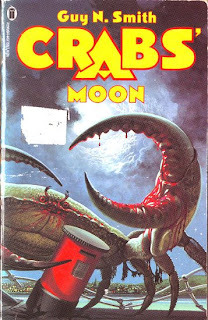 It's about telling the publishers what we want, about bringing back quick exciting reads that can compete with the latest DVD or Video Game in the thrills and spills department. So take part this Wild West eMonday - buy an eBook and show your support for the genre. It's all as simple as that - if folk take part in large numbers then shops, libraries will be getting similar requests all over the globe. Wild West eMonday - What's in a name? Nicknames, aliases and fancy monikers were popular in the Old West - often people would assume a name in order to hide from the law but sometimes it was in order to build a reputation.More often again these colourful monikers were attached to a person by friends or enemies and the name would stick whether they liked it or not. Below is a list of Wild West nicknames followed by given birth names. Big Foot Wallace (pictured) was actually William Wallace, Texas Ranger. Often the non-de-plume attached to a person would be descriptive of their appearance or manner. Thus the cold hearted bandit Charles E. Bolton became known as Black Bart and Frank Lelsie, a Tombstone gunman became known as Buckskin Frank. Theodore Roosevelt was wildly known as Bullmoose because of his hunting skills. Texas outlaw, William Martin was known as Hurricane Bill. Conman and saloon owner Jefferson Smith who was eventually lynched in Alaska was Soapy Smith. 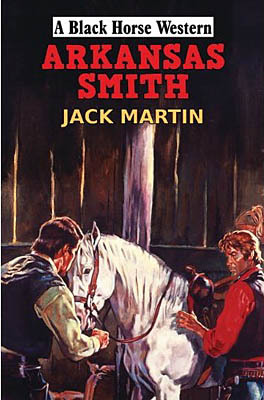 Be sure to check out Jeff Smith's Blog - he a descendant of the famous conman and writes much about the old scoundrel. General George Armstrong Custer was known as Longhair. 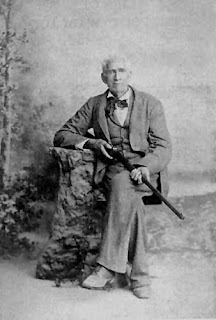 Sam Bass, outlaw, had the rather romantic title of, The Robin Hood of Texas and fellow outlaw, Charles Fallon was known as Rattlesnake Jake. 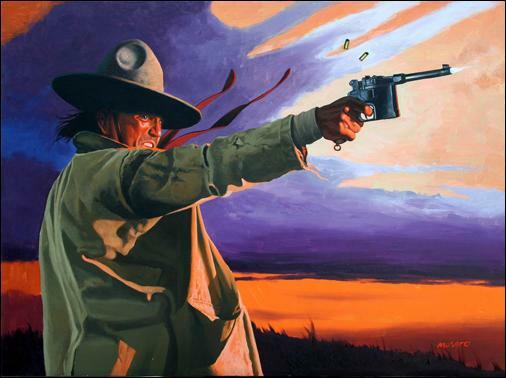 These are just a few of the colourful nicknames that abounded in the Old West - it has been an hobby of mine to document as many of these as possible over the last few years and I have a list running into two hundred names.. 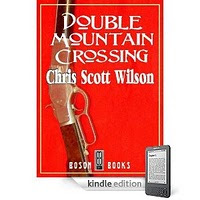 The eBook by Chris Scott Wilson was originally published by Robert Hale, home of the Black Horse Westerns imprint, and we all know that's a sign of quality. Morgan Clay had tried his hand at almost everything. When he stumbled on a rich gold vein he thought all his troubles were over, but for him trouble was just beginning. . .
. . . A Kiowa brave and two boys eager to earn their man-names cut Morgan's trail and saw the opportunity to do more than steal his horses. . .
. . . Shuck Alison, a two-bit gunslinger and card sharp, had been drifting ever since he killed his stepfather back in the hill country. His woman, Anne Marie, was a whore with the face of an angel. Together, they worked the frontier towns, an eye on the main chance. But when they found Morgan Clay, they all found more than they bargained for. 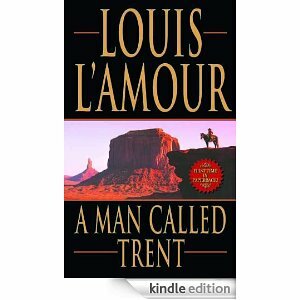 He's the bestelling western writer of all time and most of his back list is now available in the eBook formart and so for Wild West eMonday, the Tainted Archive in conversation with Beau L'amour the man responsible for keeping his father's legacy alive. 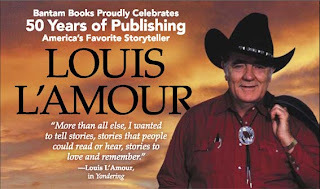 In many way Louis L’amour’s name recognition with western fans is equal with say that of John Wayne. I wonder at what age did Beau become aware that his father was this legendry figure? Removing political in-correctness from the original scripts. There are those that would say that is sacrilege. Was this decision the publishers or yours? Wild West eMonday - ? What is this 27 club? Have Amazon got it wrong? Is Doctor Who to be cancelled?